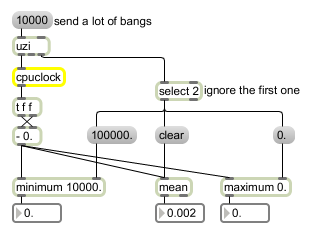 While most Max/MSP timing references "logical" time derived from Max's millisecond scheduler, time values produced by the cpuclock object are referenced from the CPU clock and can be used to time real world events with microsecond precision. bang A bang causes the current time to be output. The time value is calculated from when Max is launched (starting from 0.0). float: The current time, in milliseconds. timepoint Output a bang when a transport reaches a specific time.